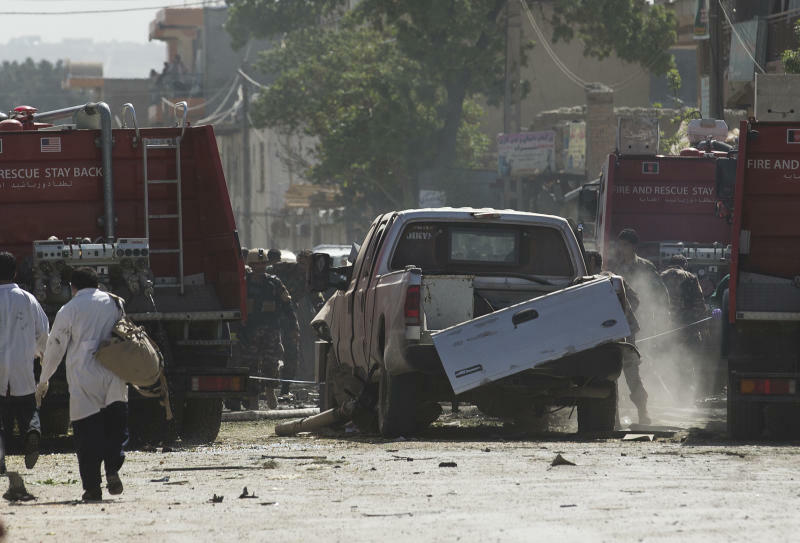 KABUL, Afghanistan (AP) — A suicide bomber rammed his car into a NATO convoy in the Afghan capital on Thursday, killing at least 12 people, including two coalition troops, four civilian contractors and two children, officials said. A Muslim militant group, Hizb-e-Islami, claimed responsibility for the early morning attack and said it had targeted an American convoy. NATO did not immediately release the nationalities of the killed troops and contractors. Six Afghan civilians, including children, were also killed in the explosion, Kabul provincial police spokesman Hashmad Stanakzi said. Hizb-e-Islami said its newly formed special "martyrdom" unit had been stalking the convoy for weeks. The announcement could mean a steep escalation for the movement, based in northeastern Afghanistan, which has fought against the American-led coalition but is also a fierce rival of the Taliban. Severed body parts littered the scene of the blast in eastern Kabul, and one coalition vehicle was reduced to a mangled pile of metal. The explosion, which wounded more than 35 others people, was powerful enough to rattle buildings on the other side of the city. The suicide bomber struck about 8 a.m. with a car packed with explosives. "The explosion was very big. It set the nearby buildings on fire," Stanakzi said. Kabul Deputy Police Chief Daud Amin said it was difficult to count the dead because the blast had shredded many of the victims. 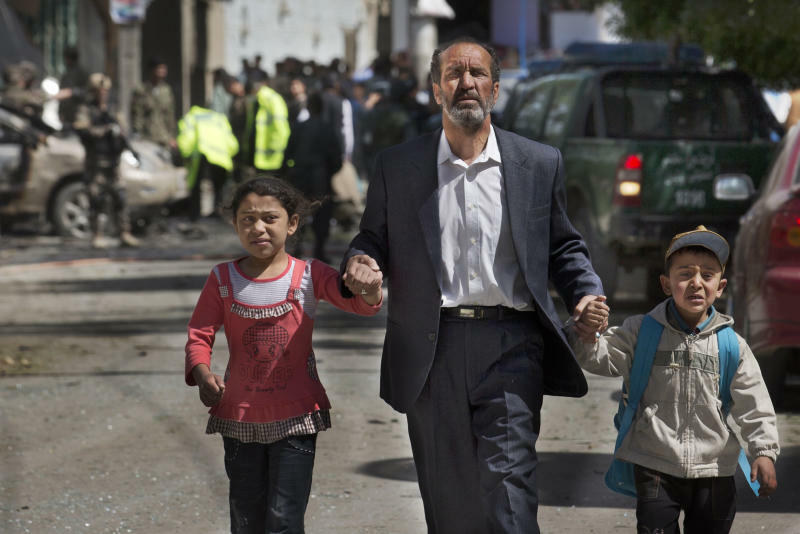 "We saw two dead bodies of children on the ground," Amin said. "But the rest of the bodies were scattered in pieces around." A spokesman for Hizb-e-Islami, Haroon Zarghoon, told The Associated Press that one of the movement's operatives carried out the attack on what he described as two vehicles of American advisers. He claimed that most of the American advisers were killed and their vehicles destroyed. He claimed the cell was established in response to alleged American efforts to keep permanent bases and troops in Afghanistan even after the full NATO withdrawal. The U.S. has repeatedly said it wants no permanent bases in Afghanistan after most foreign troops withdraw by the end of 2014, but President Hamid Karzai raised eyebrows last week when he announced he had agreed to an American request to keep nine bases. A smaller American force is expected to remain in the country to assist Afghans in keeping security, but the exact configuration of their work has not yet been decided. Hizb-e-Islami is headed by 65-year-old former warlord Gubuddin Hekmatyar, a former Afghan prime minister and one-time U.S. ally who is now listed as a terrorist by Washington. The militia has thousands of fighters and followers across the country's north and east. Hekmatyar, who was heavily financed by the U.S. during the 1980s occupation of Afghanistan by the former Soviet Union, has been declared a terrorist and is being hunted by Afghan and NATO troops. U.S. bombs have targeted his military chief Kashmir Khan in Kunar province in northeastern Afghanistan on the border with Pakistan. However, Hekmatyar's son-in-law has also held peace talks with both Karzai and also American officials. In a further sign of the complexities of the Afghan insurgency, Hizb-e-Islami is also a rival to the Taliban insurgency, even though both movements share the goal of driving out foreign troops and establishing a state that would follow a strict interpretation of Islamic law. Hekmatyar and the Taliban supreme leader, Mullah Omar, in particular, are said to share personal animosity. Thursday's attack was the second in eight months claimed by Hizb-e-Islami. In September, the militant group claimed responsibility when a female suicide car bomber killed least 12 people. At the time, Hizb-e-Islami said the attack was revenge for the film "Innocence of Muslims," which was made by an Egyptian-born American citizen and infuriated Muslims abroad for its negative depiction of the Prophet Muhammad. 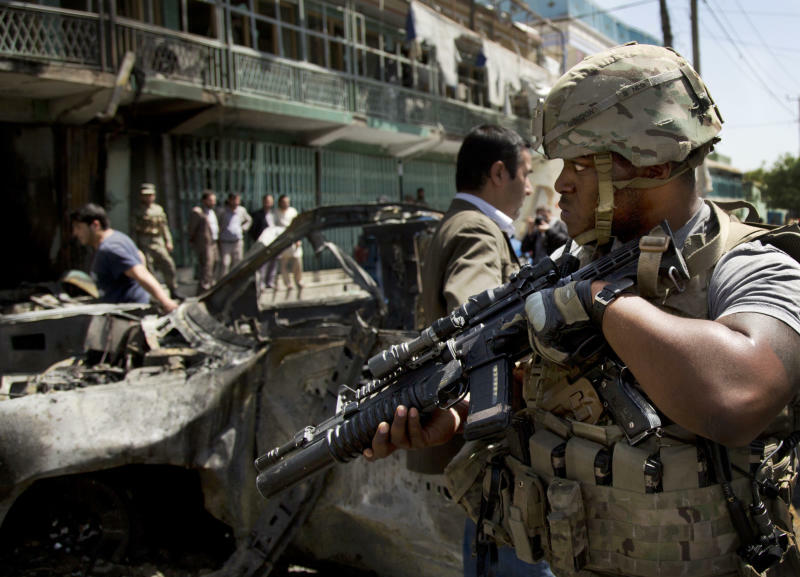 Associated Press writer Kay Johnson contributed to this report from Kabul.